Accidental fires always have the potential to devastate and even end lives. Though, the risk is even more imminent with high-rise buildings. This is because fire fighters often have a hard time dealing with fires in such places. This is mostly because of how hard it is for them to reach the higher floors of such buildings. It’s no secret that flames can grow and spread rather quickly. Though, when it comes to fires, it’s not the flames that you have to worry most about. Rather, you have to worry more about the rising temperature and the toxic gases that can kill you if you inhale enough of it. While most cities are equipped with competent and able firefighters and fire departments, it’s not like they can teleport directly onto the scene of the fire. It typically takes fire fighters around 10 minutes to arrive at the scene. By then, the fire may have already spread too much, damaging most of the establishment and leaving families displaced, or in worse cases, lives lost. With fire sprinklers, however, such disasters can be prevented. Even if the fire sprinklers aren’t able to fully extinguish the fire, it can contain the flames enough to allow residents enough time to escape safely without inhaling much of the toxic gases. To put simply, fire sprinklers can prevent fires from becoming such huge disasters, all at the fraction of the cost of what it usually would to repair any damage resulting from accidental fires. 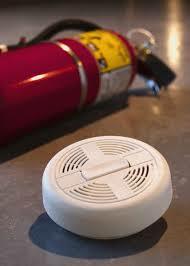 Myth #1: A smoke detector provides enough protection. Fact: Having smoke alarms can be a vital part of fire safety, but they shouldn’t be your sole form of protection. In addition, smoke alarms may also fail to work in an emergency if the batteries haven’t been changed or charged in a while. Myth #2: You can control and put out a small fire on your own. Fact: Many damaging fires start with a small accident. No matter how big or small the flames are, be sure to follow any fire safety instructions you have set in your home or workplace. Myth #3: Fire sprinklers systems will freeze during winter. Fact: If you’re worried that your fire sprinkler system will freeze during colder weather, rest assured that proper procedures are put into place during a fire sprinkler installation process to keep it from freezing. No matter how cold it gets. Myth #4: People always panic during a fire. Fact: While it may seem natural to think people would freeze up and get flustered in the case of a fire, research has shown quite the opposite. You can make sure the people in your home or building known the fire safety plan by practicing drills and learning evacuation routes. The design of fire protection systems is a multi-step process beginning with an assessment of the environment to be protected. Factors, both internal and external to the environment, are considered. This information is used to establish performance objectives for the fire protection system being designed. Our experienced engineering department conducts detailed studies to determine the optimum approach to providing the correct system application, meeting the needs of our clients in the most cost-effective way possible. We begin with a site survey of the facility then provide the client with appropriate alternatives based on an assessment of the fire protection and life safety needs. We will often consult with the client’s insurance company and the local fire department for their input during the decision-making process, in order to ensure that everything is up to code and covered by insurance. Once a decision is made on the specific type of system required, we assign a primary engineer to the project who will then develop the appropriate engineering design. Fire protection is very serious, so be sure to take every step you can to protect yourself and your property. If you would like to learn more about fire prevention systems, contact CJ Suppression Inc. at 888-821-2334 or visit www.cjsuppression.com for additional information. Accidental fires always has the potential to devastate and even end lives. Though, the risk is even more imminent with high-rise buildings. This is because fire fighters often have a hard time dealing with fires in such places. This is mostly because of how hard it is for them to reach the higher floors of such buildings. Back in March 12, The Evanston Fire Department responded to 1900 Sherman Avenue at around 4:30 PM after a fire alarm activated. Once they arrived, they were informed that a kitchen fire had started on the 11th floor. Though, upon further investigation, they’d found out that the fire had already been extinguished after a sprinkler head activated. This allowed a resident and the guest of the said unit to be able to evacuate safely. Unfortunately, one resident had to be treated due to smoke inhalation, and another three had to be assisted by the Red Cross, of which were displayed for two days. In November of 2015, the Cook County Housing Authority, directed by the Evanston Fire Prevention Bureau, retrofitted 1900 Sherman Avenue with sprinklers throughout the entirety of the whole building, residential units included. While it is unfortunate that one resident had to be hospitalized for follow-up care due to smoke inhalation, it’s easy to think of how the situation could have gone a whole lot worse. It’s no secret that flames can grow and spread rather quickly. Though, when it comes to fires, it’s not the flames that you have to worry most about. Rather, you have to worry more about the rising temperature and the toxic gases that can kill you if you inhale enough of it. You also have to consider the flashovers that may occur, as well as the other combustible materials that may burst at any given time, further adding to the damages caused by the fire. While most cities are equipped with competent and able firefighters and fire departments, it’s not like they can teleport directly onto the scene of the fire. It typically takes fire fighters around 10 minutes to arrive at the scene. By then, the fire may have already spread too much, damaging most of the establishment and leaving families displaced, or in worse cases, lives lost. With fire sprinklers, however, such disasters can be prevented. Fire sprinklers are installed in key areas throughout the establishment. They also go off as soon as the fire and the resulting smoke reaches alarming levels. This then helps contain the fire, or in cases such as the one in 1900 Sherman Avenue, eliminate it all throughout. Even if the fire sprinklers aren’t able to fully extinguish the fire, it can contain the flames enough to allow residents enough time to escape safely without inhaling much of the toxic gases. Better yet, however, is how fire sprinklers protect the affected and the surrounding rooms from fire, heat and smoke damage, minimizing the financial damages. To put simply, fire sprinklers can prevent fires from becoming such huge disasters, all at the fraction of the cost of what it usually would to repair any damage resulting from accidental fires. If you’re interested in having fire sprinklers installed in your residential or commercial establishment, contact CJ Suppression Inc. at 888-821-2334 today! 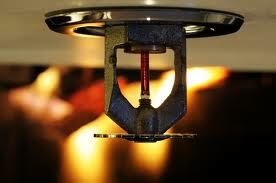 Or visit www.cjsuppression.com for additional information regarding fire sprinklers. It wouldn’t be overstating to say that accidental fires can reduce a once-beautiful home into a pile of dust and rubble. Though, even worse than the damage is how these fires often catch people off guard, further adding to the resulting devastation – financially, physically and emotionally. Given that fires can and will happen, how you and your family is prepared to deal with it is what ultimately matters. While local fire fighters are just one call away and fire extinguishers can be used to control fires, both fail to address the most important thing about fires and that’s to kill them immediately as soon as they appear. That one problem is taken care with the installation of fire sprinklers. 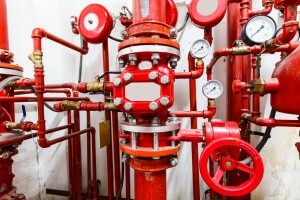 All fire protection features have what’s referred to as a reliability factor. For example, fire exits can be both blocked and locked. Fire extinguishers aren’t exactly the easiest to use. 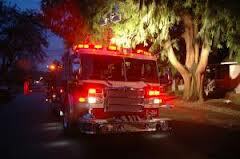 While always ready to help, local fire fighters won’t exactly arrive on the scene immediately. However, when it comes to fire sprinklers, they come off right there and then, which helps in controlling the fire and minimizing the damage done. Property damage isn’t the only thing that fire sprinklers can help with, as they can also help keep the toxic fumes at a minimum. This means that even if the sprinklers won’t be able to kill the fire, it can buy you and your family enough time to get out safely and for the fire not to grow too big once the fire fighters arrive. Still, the one knock on fire sprinklers is that they too can cause unnecessary damage in the form of accidental discharge leading to possible electric damage. While it is true that accidental discharges have occurred, the frequency isn’t exactly enough to warrant such concerns. In fact, there are records that show that accidental discharge occurs in only one in about 16 million sprinkler heads every year! To put that into perspective, you have a more likelihood of dying from a plane crash, the odds of which is about 1 in 1 million, than a sprinkler head accidentally discharging and causing damage. Freezing, causing broken fittings, cracked pipes, and may even force open valve caps. Mechanical damage due to negligence, mishandling and deliberate sabotage. The good thing is that these scenarios can be prevented through annual fire sprinkler inspections. 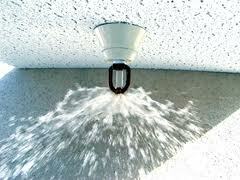 Sprinklers have an excellent track record of protecting people and buildings from accidental fires. In fact, sprinklers can benefit houses so much that even insurance companies have taken notice of this and actually offer insurance premium discounts to houses fitted with quality sprinkler systems. You can, however, only enjoy such benefits if you disregard common myths and misconceptions about fire sprinklers and actually allow them to be included as part of the fire protection system in your house and for your family. If you’re interested in fire sprinklers and would like to learn more, contact CJ Suppression Inc. in Corona, CA at 888-821-2334 or visit www.cjsuppression.com for more information. When talking about fire suppressants at home, what’s the first thing you think about? Water, yes. Though, in modern times, people have come to rely on fire extinguishers as they’re lighter, easier to carry and generally more efficient. Unless, of course, the fire has become too big to the point that water blasting through the hoses of firemen are the only remaining option. Before the fire becomes too big, however, fire extinguishers aren’t exactly the most efficient way to kill fire. No, fire sprinklers are. The most dangerous thing about fire is not its heat, nor is it the flames. Rather, it’s the toxic fumes and smoke that the fire produces. The smoke makes it hard to see and difficult to breathe, while the toxic fumes deliver a knock-out that could literally kill you before the fire has any chance of getting close to you. Given how fire spreads so quickly and how being caught in one already makes for an extremely stressful situation, thinking about killing the fire with a fire extinguisher isn’t exactly easy. There’s a huge chance that the first thing you’d want to do is get out of the house. Though, even if you do manage to get to the fire extinguisher, what happens if the flame is already too big, or that the smoke is already too thick for you to see where you’re going? Here’s where fire sprinklers come in. When installed properly and routinely checked to make sure that they’re working, fire sprinklers can, in worse case scenarios, give you and your family as much as 10 minutes of cool, clean air to safely escape from your home. 10 minutes is more than enough time for you and everyone inside to vacate the house. 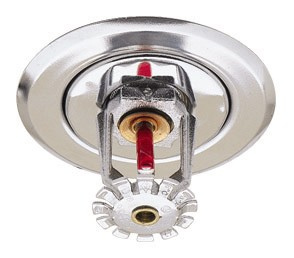 In case of a house fire, the lack of sprinklers means that there’s nothing you can do to minimize the damage. 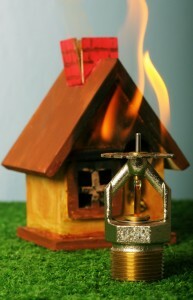 With fire sprinkler systems, however, you have a means of controlling the flame. While fire sprinklers aren’t usually enough to kill huge fires, fire sprinklers are often able to contain the fire enough to keep the damage to your home at a minimum. This, and the fact that residential fire sprinkler systems can be made so that the fire department is called immediately if the sprinklers are triggered means that the fire will be taken care of as soon as the firefighters arrive. Of course, the added cost of having fire sprinklers installed and maintained isn’t exactly cheap. Though, you’d be glad to know that the installation of fire sprinklers does add value to your home. Your home should be valued much higher, and insurance premiums should be cheaper as most insurance companies are fully aware that it is cheaper to cover the damage of a burnt kitchen than it is to cover the expenses of a house burnt down to the ground. There are also plenty of other advantages that any homeowner can enjoy if they choose to have a residential fire sprinkler system is installed. Still, the fact that you, your family, as well as your investment, is well protected is the most important factor. The rest, such as cheaper insurance premiums, and so on, are just icing on the cake. If you would like to learn more about fire sprinkler systems, contact CJ Suppression Inc. in Corona, CA at 888-821-3-2334 or visit www.cjsuppression.com for more information. CJ Suppression proudly serves Corona, San Bernardino, Yorba Linda, Anaheim, Victorville, Irvine and all surrounding areas.